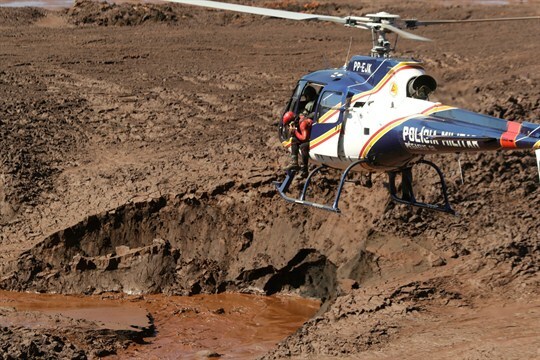 A helicopter flies over the mud in search of bodies, days after a mining company’s dam collapsed in Brumadinho, Brazil, Jan. 30, 2019 (AP photo by Andre Penner). The death toll continues to rise in southern Brazil after the collapse of a tailings dam at a mine last month triggered a massive mudslide. In what is being called the country’s worst environmental disaster, 134 people have been confirmed dead and another 199 are still missing in the nearby town of Brumadinho, in Minas Gerais state. Five people have been arrested as part of an investigation into the collapse, and a Brazilian court ordered the mine’s operator, Vale S.A., to stop using eight other tailings dams, which are constructed out of the waste materials left over from mining operations. In an interview with WPR, Bruno Milanez, an associate professor of industrial engineering at Juiz de Fora Federal University in Minas Gerais, discusses the political power of Brazil’s mining sector and the lax oversight that allowed this disaster to happen.